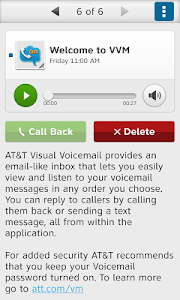 AT&T Visual Voicemail enables you to review and manage your voicemail directly from your smartphone eliminating the need to dial into your mailbox. Note: Receiving voicemail on this Visual Voicemail application does not count against your data rate plan allotment while on the AT&T network. 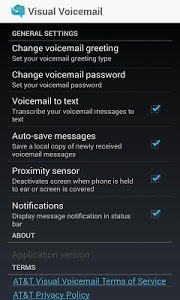 A cellular data connection is required; AT&T Visual Voicemail does not work on a Wi-Fi only connection. 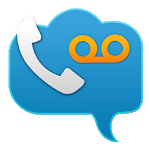 International data and messaging charges apply to receiving, replying to, and forwarding voicemail messages while roaming internationally. Data and messaging used in replying to and forwarding voicemail messages via SMS, MMS, or e-mail are counted against your data and/or messaging plan, and applicable charges apply if data and/or messaging plan limits are exceeded. 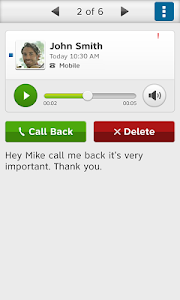 Data charges may apply when downloading this application or using text transcription. 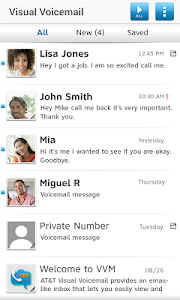 This app may send a free one-time SMS to AT&T to retrieve mailbox information. Similar to "AT&T Visual Voicemail"